In this post, I will discuss the relationship between showing skin and the Larme aesthetic. 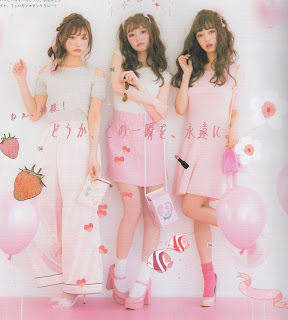 Skin exposure in Larme-style coordinates depends on the particular coordinate's styling and on the balance of the clothing cuts. 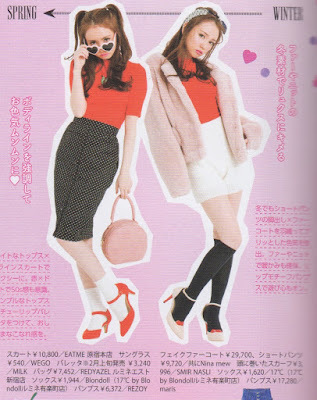 While Larme-style coordinates can be revealing, they do not aim at expressing sexiness. Revealing coordinates are styled according to Larme's dolly, girlish, and refined aesthetic. Pastel and muted color palettes, a mixture of various interesting textures, and classic or retro stylings help create this balance. It is hard to find coordinates in Larme that are completely revealing or completely covering. Most of the time, revealing pieces and elements (such as crop tops and cut-out details) are balanced by modest pieces and elements (such as midi skirts and mock-neck collars). 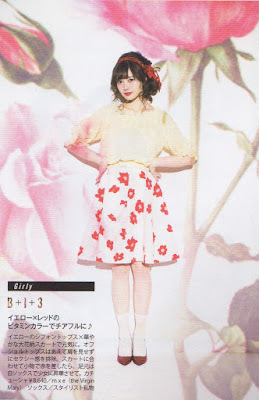 You can find examples of this type of balancing throughout the Larme scans in this post. The magazine also shies away from certain kinds of skin exposure that do not suit its aesthetic. For example, tops that are very low-cut in the chest and very low-waisted bottoms are not common. There are revealing pieces and modest pieces that are uniquely emphasized in the Larme. Crop tops are in nearly every Larme sub-style. They go along with the magazine's focus on creating leg emphasis (especially when combined with high-waisted bottoms) and long, slender, and dolly silhouettes. Sheer items create an air of delicacy, maturity, and femininity. Sheer tops and bottoms are often layered on smaller (and sometimes contrasting) pieces underneath such as camisoles or miniskirts. Off-the-shoulder, cut-out detail, and sheer panel detail items similarly emphasize a youthful, romantic, and refined sort of girlishness. 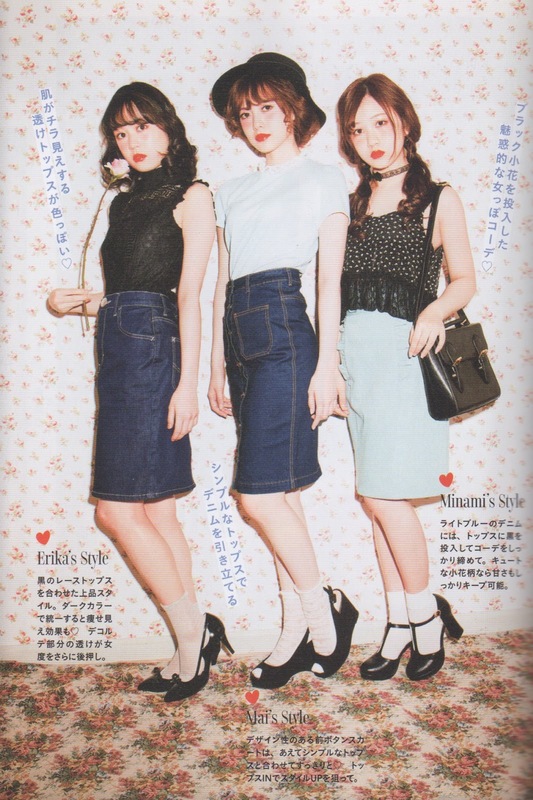 Mini skirts, mini dresses, camisoles, and shorter shorts are also often in Larme, but they are popular in many other Japanese styles as well. Here are some examples of the revealing pieces that are especially common in Larme. The midi skirt is a key component of many Larme-style coordinates. Pencil midi skirts tend to be more common in the Pheromone Fetish, Pin-up Dolly/Retro, and Loose Grunge styles while A-line midi skirts tend to be more common in the Romantic Girly and Basic French styles. Gaucho and wide-legged pants, long culottes, and maxi skirts lend an effortlessly soft and feminine look to Larme-style coordinates. These bottoms are often made of delicate and flowy fabrics such as chiffon, tulle, and satin. They are staples of the Dream Casual style. Here are some examples of midi skirts, maxi skirts, gaucho pants, and long culottes. Skin exposure in Larme-style legwear and depends on the balance of skin exposure in the rest of the outfit. 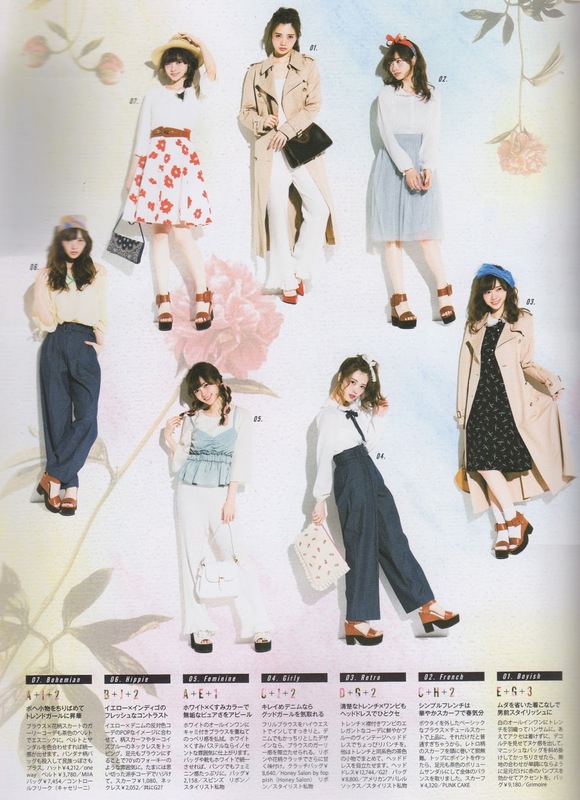 Legwear is particularly important because most Larme-style coordinates involve heels or sandals. Socks that come up to above the ankle are often worn with shorter bottoms (such as midi skirts and mini skirts). Knee socks are commonly worn with shorts and very short miniskirts. When long bottoms (such as pants or maxi skirts) are worn, Larme-style coordinates tend to be sockless. Full legwear (like pantyhose, tights, or stockings) is less common but can be found in Pheromone Fetish, Romantic Girly, and Loose Grunge. Full legwear in Pheromone Fetish in particular involves sheer pantyhose/tights, lace-patterned tights, or fishnets. Not all Larme sub-styles are created equally in terms of showing skin. If you plan your outfits according to circumstantially appropriate levels of skin exposure (such as for the workplace or for a party), you may want to focus on different Larme styles. Pheromone Fetish is the most revealing Larme style. Dream Casual is the most modest. French and Romantic Girly tend toward the modest side while Pin-up Dolly and Loose Grunge tend toward the revealing side. Pheromone Fetish coordinates commonly involve see-through lace blouses and sheer detail skirts. Camisole tops and dresses, sheer panel tops, and heart cut-out tops are also common. 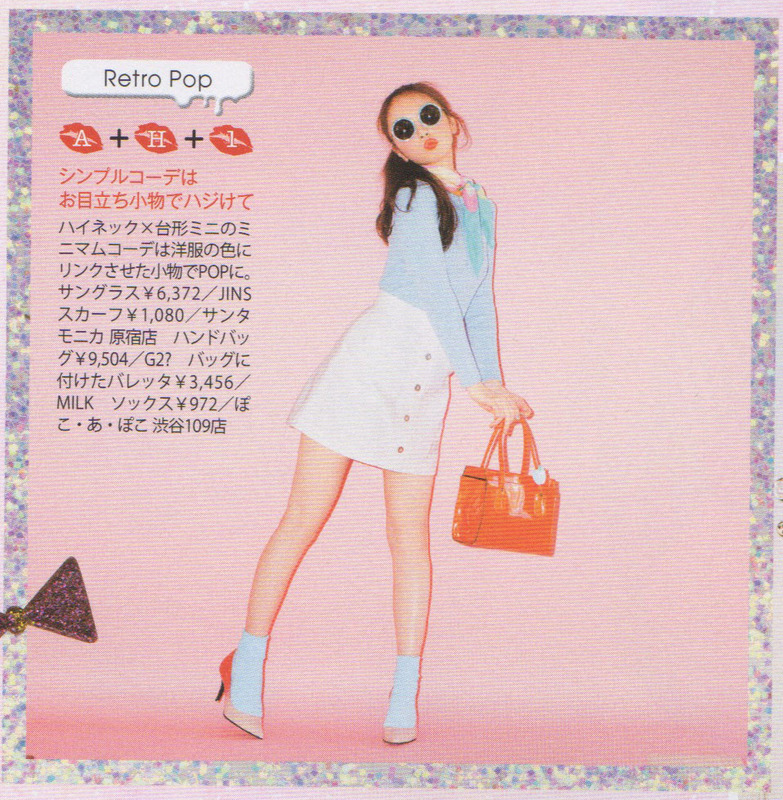 In addition to making use of midi pencil skirts and wide-legged pants, Pheromone Fetish emphasizes miniskirts and shorter shorts. Legwear in Pheromone Fetish tends to be sheer, lace-patterned, or fishnet-patterned. Boudoir-slipper style heels are often worn without socks. 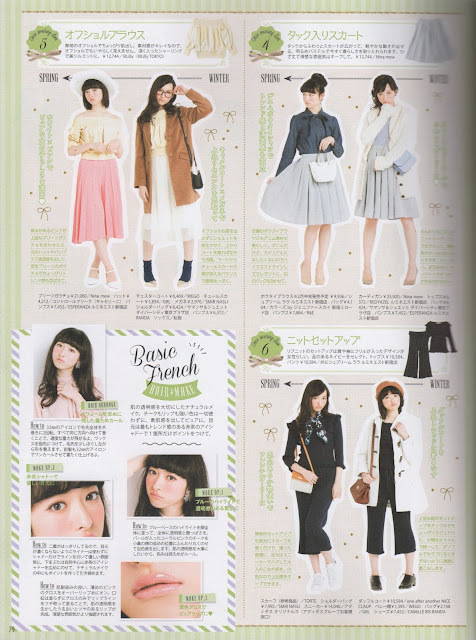 Dream Casual coordinates often show no skin at all. Maxi skirts and long culottes are the most popular bottoms in this style. Mini skirts and mini dresses are rare. There are sheer lace pieces in Dream Casual, but they are layered over more covering pieces like T-shirts and longer skirts (as opposed to camisoles, bralettes, and miniskirts in Pheromone Fetish). T-shirts and sweaters are very common. French (or Basic French) is less revealing than Pheromone Fetish, Pin-up Dolly, and Loose Grunge. The style is somewhat more revealing than Dream Casual. The blouses and sweaters in French are quite modest. Wide-legged pants and skinny jeans may also be worn. 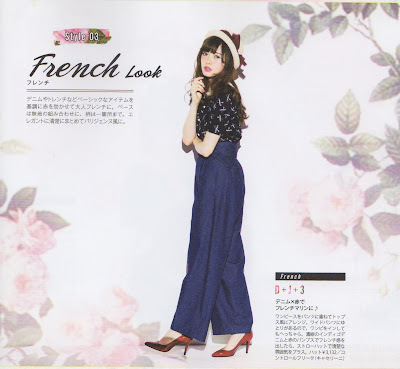 French also involves midi and above-the-knee length skirts. This style may not feel revealing at all to those who are accustomed to midi skirts. Like in French, skin exposure in Romantic Girly mostly comes from the A-line midi skirts. When opaque tights are worn, Romantic Girly coordinates can also be completely covering. 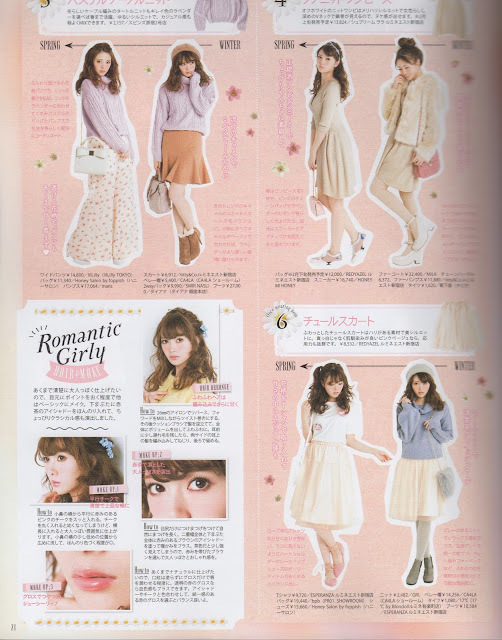 The blouses and sweaters in Romantic Girly are modest as well. Pin-up Dolly (or Retro) utilizes a wide range of bottoms including miniskirts, A-line midi skirts, pencil midi skirts, shorter shorts, and skinny jeans. Mini skirts and shorter shorts are the most revealing bottoms in this style. 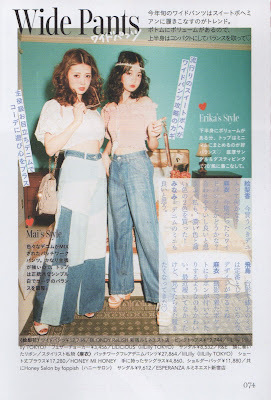 The skinny-cut pants in Pin-up Dolly are more revealing than the wide-legged pants or culottes in other Larme styles. Crop tops and off-the-shoulder tops can also be found in Pin-up Dolly. Loose Grunge often makes use of sheer pieces that are layered over smaller, revealing pieces (such as shorter shorts). 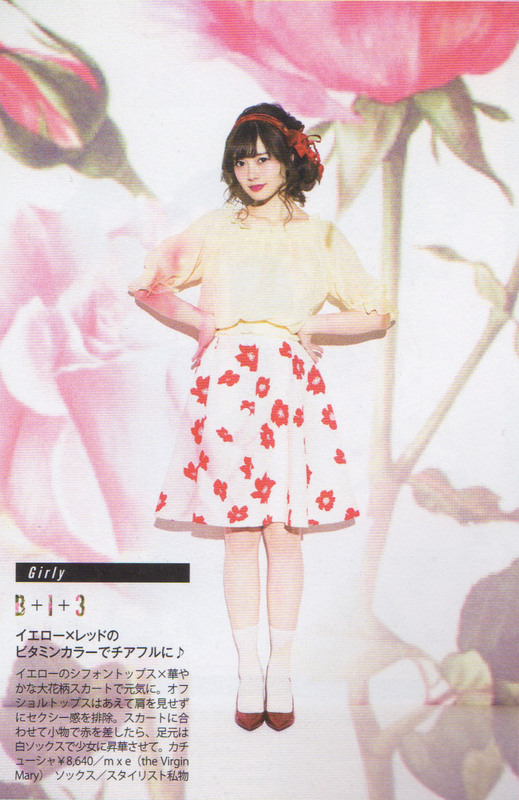 (The girly grunge brand Fallin' has good examples of this kind of styling.) The mini skirts and crop tops in Loose Grunge tend to balance out the larger and/or less structured outwear pieces. Pencil midi skirts and wide-legged pants are also common in Loose Grunge. Skin exposure in Larme is carefully crafted to balance clothing cuts and to highlight the magazine's unique aesthetic. 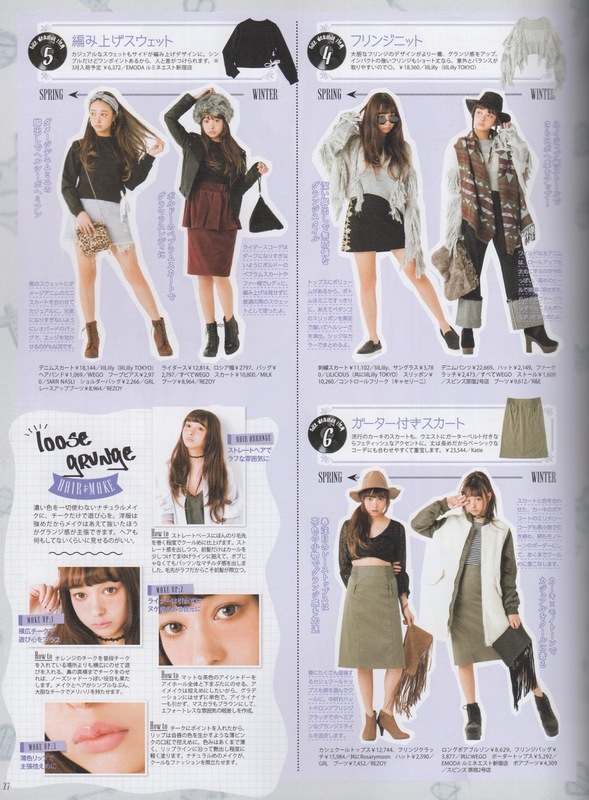 The magazine emphasizes a variety of unique revealing pieces and modest pieces that individually conform to the Larme look. If skin exposure is a factor that you consider while planning outfits, you may want plan your outfits according to different Larme sub-styles. Pheromone Fetish tends to be the most revealing style while Dream Casual tends to be the least revealing style. As usual, I would greatly appreciate your feedback. And if you have suggestions for how to improve this post, I would love to hear them.